You are never gonna keep me down…. Still no? Here’s a link to the video. 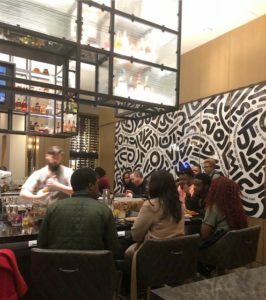 This song is what comes to mind when I think about Kwame Onwuachi, creator and Executive Chef of Kith/Kin, the one-year-old Afro-Caribbean restaurant at InterContinental Washington D.C. – The Wharf. 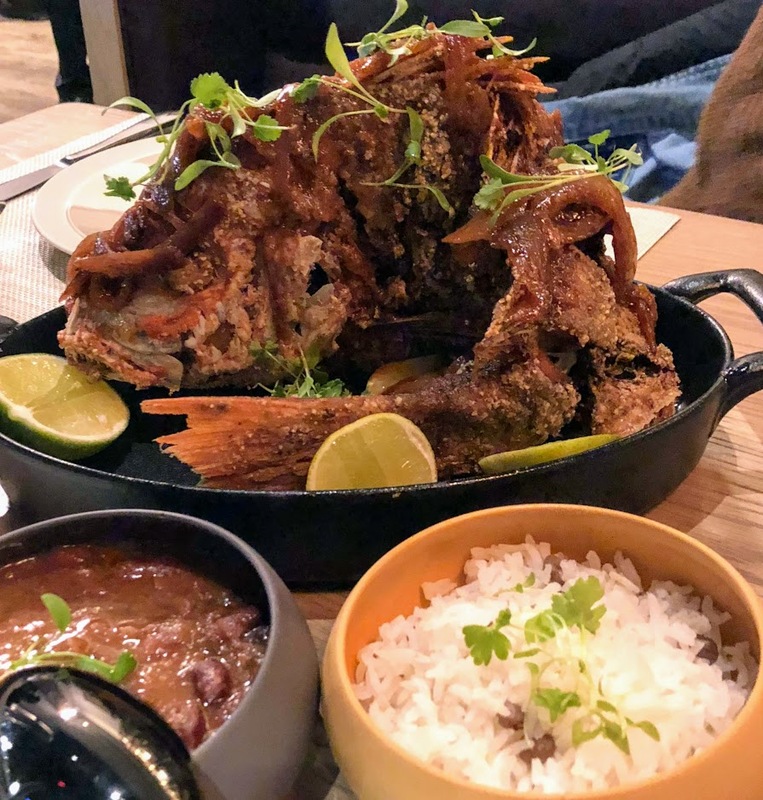 Kith/Kin is doing quite well, recently garnering superlative reviews from Bill Addison on Eater and Tom Sietsema in the Washington Post. But the path to success wasn’t always easy for the 28-year-old chef. He’s had his share of challenges, both personal and professional. Onwuachi’s story has been covered in many publications, but if you are unfamiliar with it, here’s what you should know. He was raised by a single mother in the Bronx. She is a caterer, which sparked his interest in food at a young age. He lived in Nigeria with his grandfather from the ages of 12-14. At 21 he sold candy bars on the New York subway to fund his own catering business. His perseverance ultimately led him to the Culinary Institute of America, and then to high profile fine dining restaurants Per Se and Eleven Madison Park in Manhattan. He was cast on “Top Chef” season 13. Here he captivated viewers- including me- with his charismatic television persona. He seemed poised for the finals but was knocked out in Episode 12, after incorporating frozen waffles in a dish. He got another shot at the “Top Chef” title in season 15, when Bravo brought back four chefs to compete in “Last Chance Kitchen.” He was defeated again. But the chef, lived up to his motto posted on the Bravo TV website “Never Give Up.” He acknowledged his mistakes and his intention to move on. 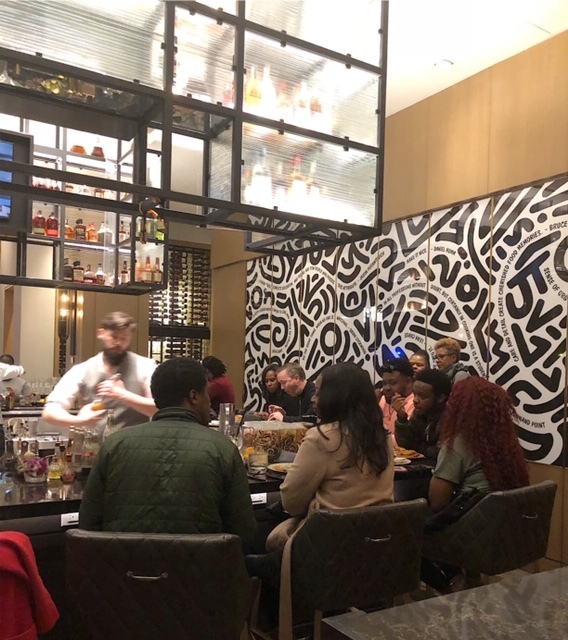 The menu at Kith/Kin is inspired by Onwuachi’s diverse heritage; paying tribute to his favorite childhood family meals and recipes, and his extensive travels. The food focuses on Caribbean flavors, Creole cuisine, and African accents merged with creative and modern touches. 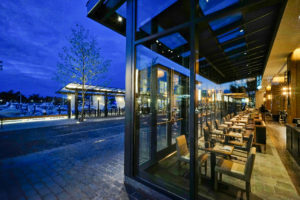 We find the prices reasonable, ranging from $10 to $18 for small plates and mid to upper $20’s for most entrees. Whole fish is $55- not bad for a dish of this quality and quantity. Still, I’m hoping for wowed, and I’m not entirely feeling it. I vow to return to see if I’m missing something from this talented chef. It takes nearly eleven months for my return to Kith/Kin. It’s not intentional, it just happens. Just prior to my visit Tom Sietsema posts his review. This review ramps up my enthusiasm. This go-round we dig into sautéed kale with charred broccoli and crispy potatoes. At first bite we are surprised by the intensity of the heat. It is a back of the throat burn that lingers. 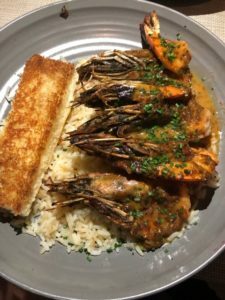 My husband and I are never one to shy away from spicy food, and we sit up straighter in our chairs, happily preparing for what will come next. 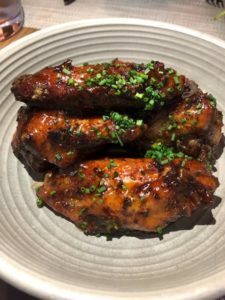 What’s next is smoked wings that glisten with a fiery Jamaican honey barbecue sauce. I eat a wing, take gulps of water, and dive in for the next, undeterred by the sticky sauce clinging to my fingers. 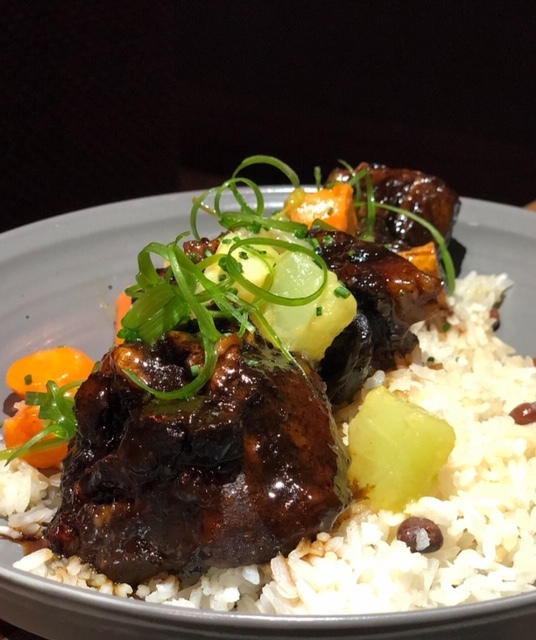 A Caribbean dish of braised oxtails with jasmin rice, pigeon peas, and glazed carrots initially appeals to me as warm and comforting, but it’s really so much more. The velvety meat, redolent with all-spice, falls off the bone. I am thrilled by the depth of flavor. I must tear myself away to leave room for other dishes, but it beckons me back… repeatedly. We reorder two dishes from our first visit: for my husband this means a feisty plate of Jollof rice with torched mackerel; for me it’s Mom Dukes Shrimp featuring wonderfully messy peel and eat shrimp, served with buttered rice and toasted brioche to help soak up the lively sauce. My lips are burning but I smile through the sear. Jamaican coco bread is brought to the table as a precedent to the meal. It’s warm and buttery and sweet, and if you save it to eat with some of the other dishes, it will help cut the spice. I challenge you to hold off on devouring it. South Africa is represented in a plate of cucumbers with chunks of avocado, a sprinkling of puffed quinoa for texture, and gooseberry piri piri. 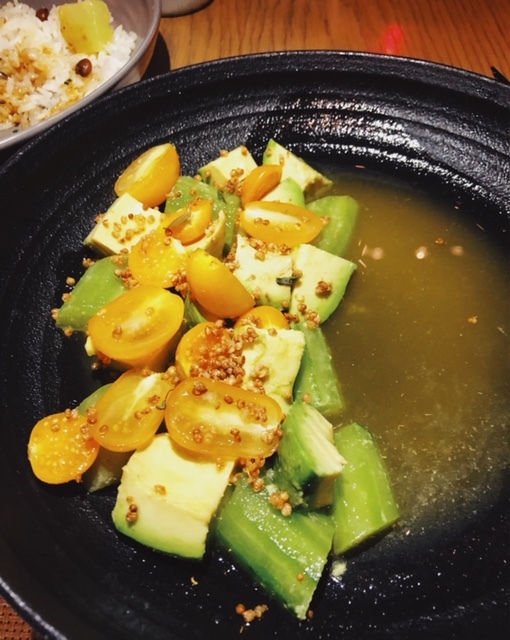 It’s light and refreshing with plenty of acid, a pleasant respite from some of the heavier and spicier dishes. You’ll want to leave room for dessert. West African Puff Puffs – a cross between beignets and doughnuts come with dipping sauces. 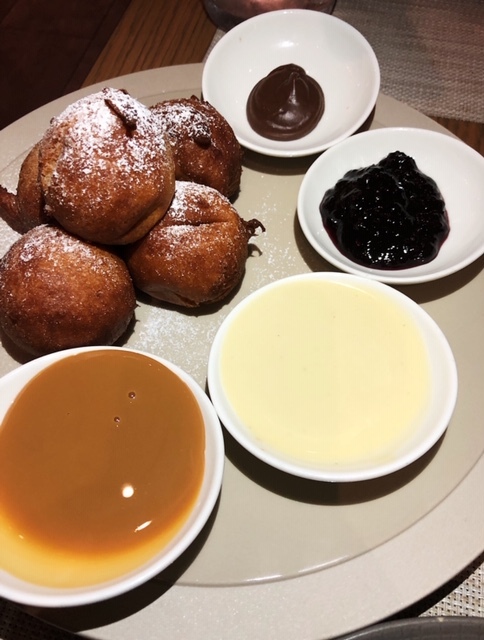 They’re fun to mix-and-match, with thick marionberry jam and dulce de leche winning my vote over sorghum anglaise and chocolate mousse. But do try them all. 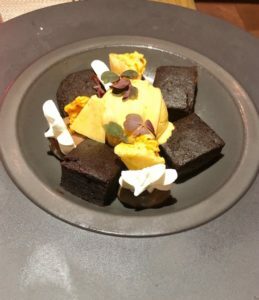 There’s also an appealing moist chocolate rum cake paired with carrot ice cream, crunchy milk foam tuiles, and sorrel. Kith/Kins’s shiny brown and gold dining room looks out onto the bustling waterfront. Adding a personal touch is a large custom mural featuring quotes from his mother and chefs he admires. My husband and I are gobsmacked. Every dish is bold and bright, punched up to perfection. The chef and his team have clearly found their footing. Chef Kwame Onwuachi has been knocked down over the years, but he has always landed on his feet. 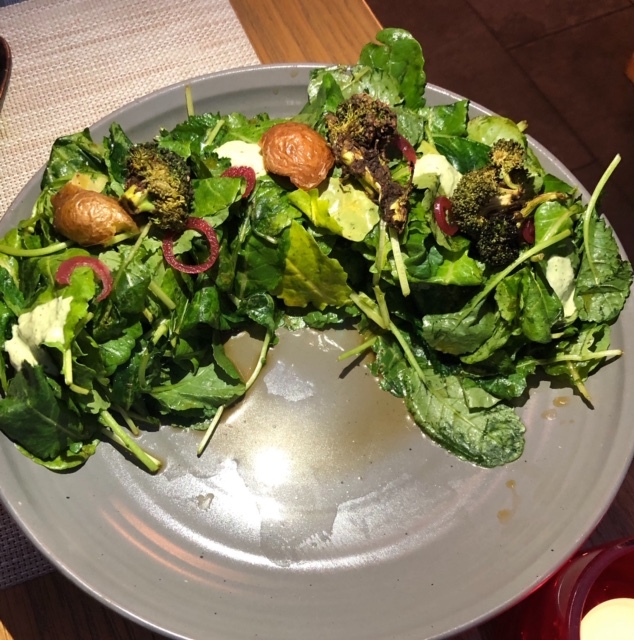 Count me among the diners who are being knocked out by his food at Kith/Kin. 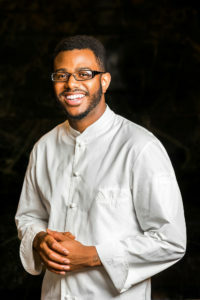 “Notes from a Young Black Chef: A Memoir” to be released in April 2019.